Soldiers recently stood by and watched as Arabs attacked Jewish motorists in the Hevron region, a resident has reported. Nehama Fishelvitch of Kiryat ARba was driving from her workplace in Tekoa toward her home on Monday when suddenly she encountered an Arab mob. Dozens of men hurled heavy stoned at her car, causing serious damage. “I opened the window, and they told me there was nothing they could do,” she recalled. Several other drivers were attacked as well, and their cars damaged, she said. It was a miracle that nobody was hurt, she added. 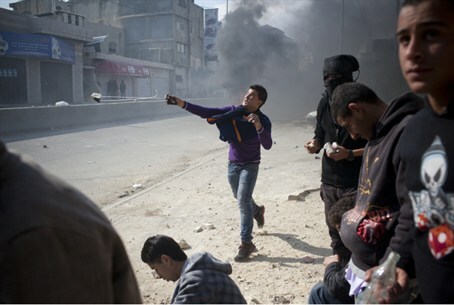 Additional sources told Arutz Sheva that, following the attacks Fischelvitz reported, additional troops were sent to the scene to disperse the attackers. Military sources said that the IDF takes attacks on motorists seriously and has the tools to deal with them. A similar incident occurred one month ago, when Arabs attacked motorists north of Jerusalem and police did nothing.